We make every effort to exceed our clients expectations. Nothing motivates us more than making our customers happy. We are proud of the service we provide, and work hard to earn referrals and repeat business. When our customers take the time to share their experience with us it makes our day. We share these with you and hope that you will add your own review to be shared by us. Have an awesome day! Shred Bull arrived on time, was pleasant, quick and affordable. I had a fantastic experience with Shred Bull today. All of life should be this easy, and this affordable. Shred Bull is absolutely as good as it gets. we will never use anyone else as far as I am concerned! 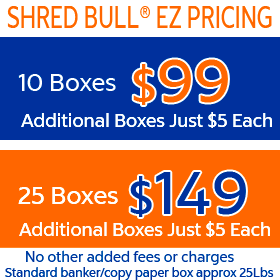 Our experience with Shred Bull Shredding has been fabulous. Shred Bull Shredding rips it up. Shred Bull Shredding is go to for shredding!! I would highly recommend it without any reservations!! Great company will definitely use again! I highly recommend Shred Bull Shredding Company. Much easier than I thought. Super easy, and very prompt. Best Shredding Company In Orange County! We service accounts in the field Monday-Friday 7:00AM- 7:00PM and are open on the weekends by appointment. Are you a customer? 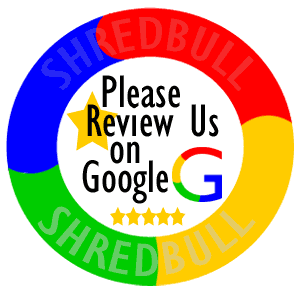 Please give us a quick shredding review. (it only takes a few seconds to fill out). Much gratitude! We really appreciate you taking the time to give us a review. We love to get reviews!